At first sight, HTC's new flagship instilled a feeling of deja vu in us, but we decided to give it a chance and not judge the book by its cover. Well, it turned out to be a pretty mixed bag – the One M9 is certainly an improvement over the One (M8) in certain areas, but also a pretty disappointing step backwards in other pretty vital ones, like battery life and display quality. However, is it a better overall device than a rival flagship that is seemingly a bit long in the tooth already, a Motorola Moto X (2014)? There's only one way to find out – by taking a closer look at them, of course! 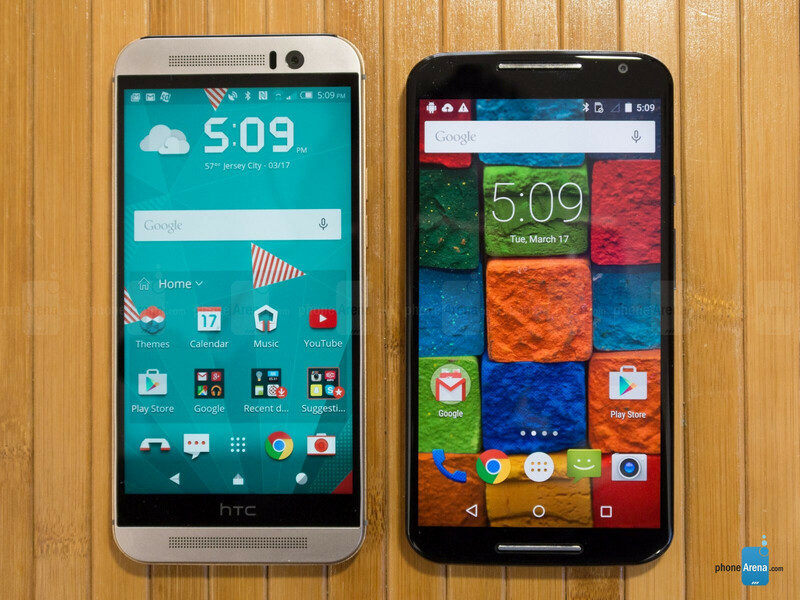 The HTC One M9 and the Moto X 2014 are pretty different on the outside. 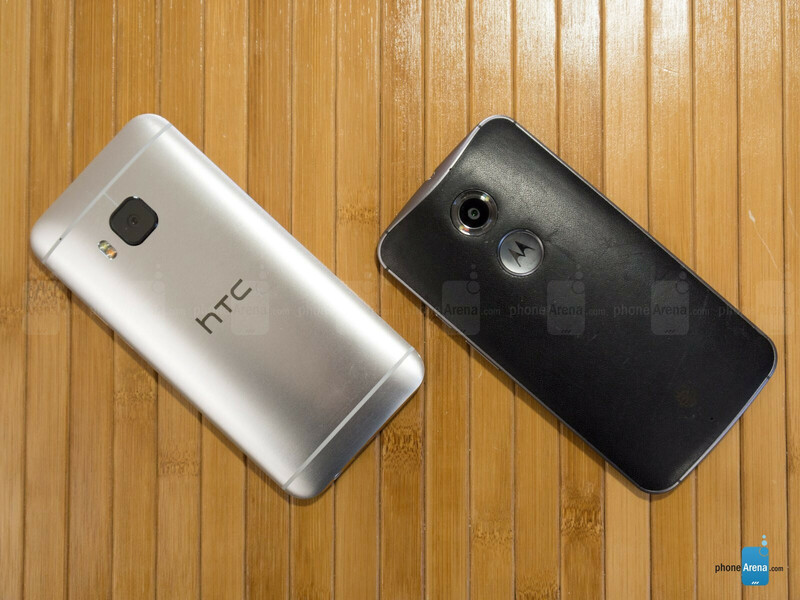 Despite that both phones employ metal in their build (the whole of the One M9 and the frame of the Moto X), the HTC entrant certainly packs a more “premium” vibe thanks to its sleek aluminum exterior. Not that the Moto X 2014 feels cheap, but it somewhat lags in terms of exclusiveness. We should not forget that thanks to Moto Maker you can choose between a different rear covers – plastic, leather, or wooden ones. In terms of size and ease of use, both phones sit pretty close to one another. The slightly taller, yet narrower and slimmer HTC One M9, however, feels just a bit more friendly towards single-handed usage. However, the Moto X boasts much better screen-to-body ratio than the One M9 (73.46% vs 68.52%) thanks to its larger display (5.2”) that surpasses the One M9's one by 0.2 inches. We should also note that both handsets have front-firing speakers, though only one of Moto's is a loudspeaker (the other being an earpiece); things are different in HTC's camp where we have two BoomSound stereo speakers. Last, but not least, we should mention that both phones employ a certain level of water-protection – IPx3 for the One M9 (light water spray resistance) and a splash-resistant coating on the Moto X. The eternal clash between LCD and AMOLED displays lives on! In particular, we are dealing with a 5.0” S-LCD 3 screen at the front of the One M9 and a 5.2” AMOLED one on the Motorola. Both are 1080p ones, which means that the pixel density of the HTC flagship is marginally higher – 441ppi vs 423ppi. We'll be totally honest - in terms of their properties, neither display is too close to perfect. Moto X's AMOLED is quite saturated and vivid; unfortunately, its color balance is all over the place. Not that HTC has stricken the bull's eye with the screen of its One M9 – it's definitely a step in the wrong direction when compared to the older HTC One (M8), which is pretty disappointing. Fortunately, the display doesn't disappoint in the brightness department – you'll have no problems viewing it in broad daylight. In terms of color temperature, the Moto X performs better than the HTC – we have a temperature of 7056 Kelvins, it trumps the One M9 with its temperature of 8114 Kelvins (reference point is 6500 K), which means that the latter is more bluish and cold than the AMOLED offering in the Motorola. 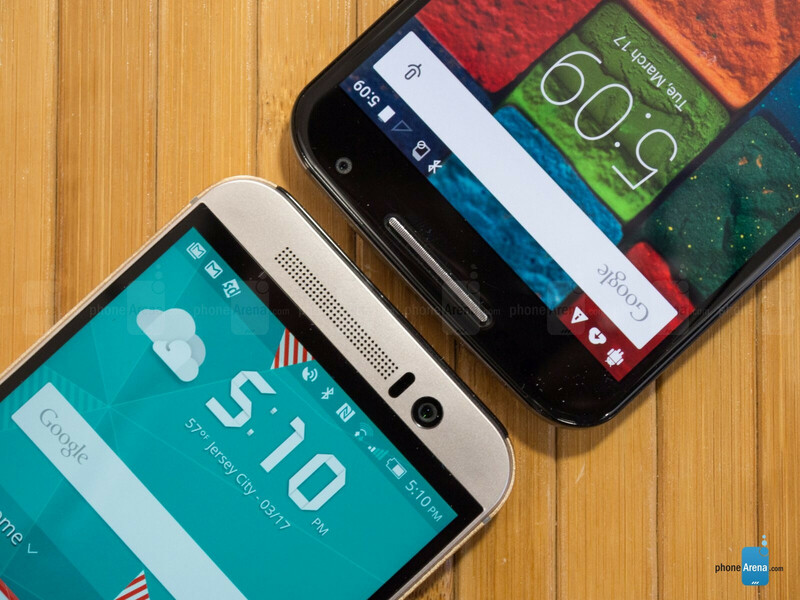 Moto X 2014 continues to look meh compared to the competition. Besides the camera the Moto X is a great phone. I can't believe how much blur there is from the Moto X pictures. Well 2 things to consider, moto x's battery is really short but turbo charger does improve charging, maybe not 8 hours in 15 minutes as said, but at least 30-40% that depending on the use, can be convenient. Another thing I noticed is that long-shot focusing in M9 was quite slower than moto x's, but worked better at short distances. Has anyone tried this anywhere to see if that's normal or it was just that specific case?